Switch-mode conversion has been widely adopted for industrial and OEM applications where fixed voltages are used and stabilization demands are modest. But it has had limited use in instrumentation power supplies owing to the difficulty in obtaining zero-to-max control with high resolution. Another inhibiting factor has been the need to suppress the switching noise in the power supply's output. Such filters normally make output control relatively slow. Traditional switch-mode designs aim to be smaller, lighter, and more efficient. To obtain this, designers push the envelope of switching frequency, which results in greater noise generation from the Mosfets and rectifiers. Parasitics of the circuit and power components tend to resonate at high frequencies, producing spikes and bursts of high-frequency oscillation which are difficult to filter because they are radiated and can be picked up on the input and output terminals. The radiated noise can even be picked up by other instruments and devices and the connect wires. This would be unacceptable in a lab-bench supply. With the introduction of Kepco's new Series ABC bench models, a significant turning point in fast, general-purpose interface board (GPIB)-controlled instrumentation power supplies has been achieved. ABC is a 100-W bench-style power supply featuring an integrated keypad/GPIB controller with full talk/listen capability using zero-up switch-mode topology for efficiency, light weight, and small size. It features power-factor correction, universal ac input, and EMI suppression. The challenge was to design a laboratory-bench power supply that enjoyed the size/weight efficiency of high-frequency switching while retaining the speed, control resolution, and low-noise output that characterize instrumentation power supplies. In addition, the design team undertook to incorporate such recent advances in switch-mode design as universal (or wide-range) ac input with power-factor correction so that the unit can be plugged into mains anywhere in the world. 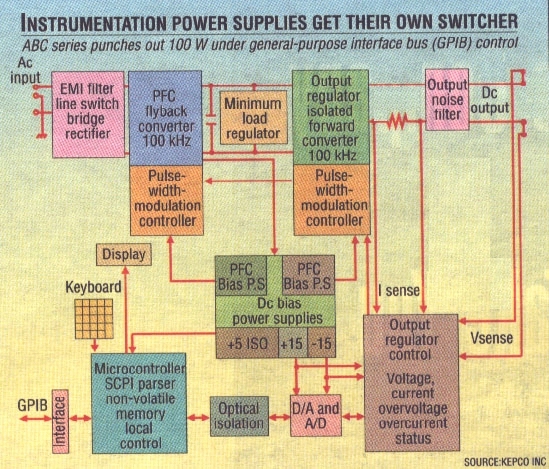 On the control side, a microprocessor was used to control cost by integrating the GPIB circuit with the power supply's keypad interpreter, display, and power-control elements. The microprocessor continuously monitors the power supply's output voltage and current using A/D converters. The display is updated once per second with the current value(s). Additionally, the values are stored in a buffer to be available for external monitoring. Whenever a GPIB command needs to be processed, the microprocessor interrupts the monitoring and receives, parses (interprets), and executes the GPIB instruction. The microprocessor also responds to keypad inputs and, of course, translates all input instructions into a control signal sent to the power supply's pulse-width modulator (PWM) via a D/A converter. Between the GPIB input and the ABC power supply's output there is 500 volts worth of optical isolation. In Kepco's ABC, there is no such thing as a GPIB card. The IEEE-488 control is integral to the rest of the power supply's control. This has been applied in a family of six models ranging from 10 V at 10 A to 125 V at 1 A. These models do not use any sort of linear post regulator, but, instead, use a zero-up switch-mode topology to retain the size, weight, and efficiency advantages allocated with switching power conversion. One of the objectives of the design was to provide a large dynamic range to permit high gain within the stabilizing control loop. This allowed the necessary feedback for tight stabilization and permitted the resolution needed for digital control to 12 bits. Another objective was to design a sophisticated output filter to trap high-frequency ripple and noise. The output-regulating circuit is a one transistor forward converter operating at a fixed switching frequency of 100 kHz. The control is built around a Unitrode UCC3570 chip operating in voltage-control mode with a large amplitude ramp (1 to 4 volts) generated by a very stable internal oscillator. The error amplifier receives its signal via an opto-isolator from either the voltage or current comparison amplifiers and provides the control signal to the PWM. Since the ABC is an automatic crossover voltage/current stabilizer, there are two comparison circuits - one for voltage, the other for current. Each has a programmed reference. A multi-pole, zero-compensating network is used around each amplifier and within the overall regulating loop, stabilizing the power supply. By using two cascading amplifiers with properly designed stabilizing networks, it was possible to achieve a large loop gain at dc and low frequencies, which translates to line/load stabilization under 0.01 percent. This is extraordinary performance for a switcher. To allow operation all the way to zero, a preload circuit is implemented to maintain a minimum output load whenever the output voltage or current approaches zero. The main output filter smoothes the switcher's pulses into a clean dc. The component values were carefully selected to obtain fast programmability (a 2-ms response to programming changes) and excellent response to load transients (5 percent transient change followed by a 200-microsecond recovery). Noise suppression was achieved by placing snubber networks at the points where noise is generated, and by controlling the rate of change (dV/dt and dI/dt) of power switching components. Special attention was given to the physical layout of the foil patterns on the pc cards, and filters were designed and installed to impede both common-mode and normal-mode noise propagation. This was done for both ac input and dc output. Although designed as bench instruments, ABC can easily be integrated into automatic test systems. The built-in interface permits user control over voltage, current overvoltage, and overcurrent settings, and read-back of voltage, current, and status using SCPI commands (IEEE 488.2). A virtual-instrumentation-software-architecture (VISA) driver is provided on disk for users who wish to integrate the ABC with systems using National Instruments LabView, LabWindows, or other graphical interfaces. To enhance usability, the ABC has a non-volatile memory to store 40 different combinations of voltage, current, overvoltage, overcurrent, and duration. These can be loaded to form mini-programs or repeating cycles to exercise devices. Another by-product of the all-digital approach is keyboard-controlled calibration. There are no mechanical trimmers or potentiometers in ABC. All full-scale or zero adjustments are made from the keypad or via a GPIB connection. They are stored in memory and can be password protected.